Sweet Pea is a little bunny who lives in a quiet cozy hole by the stream. 1st and she has enough time to get everything ready for the holiday. But then, other family members write to say they are coming too. Sweet Pea must work hard and overcome some obstacles in order to make everything ready on time. I’m sure those little hands would love to browse this delightful book over and over again. The combination of text and illustrations is very clever. Some details of the story are told via illustrations only, making the read more interesting and challenging. different color and font size, thus the reader can identify them easily. minds for many hours. 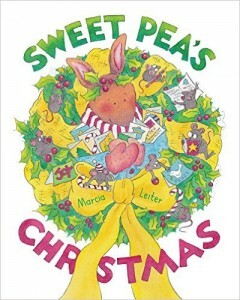 I also love the activities at the end, where the author shares with the readers Sweet’s Pea ornaments ideas and recipes. Although I find the book quite charming, I think it’s somewhat too long. There are too many repititions to my taste and there isn’t any development in the plot, that’s why I give it only 4 stars. On the other hand, its the illustrations that make this story, not the text, and they are wonderful.